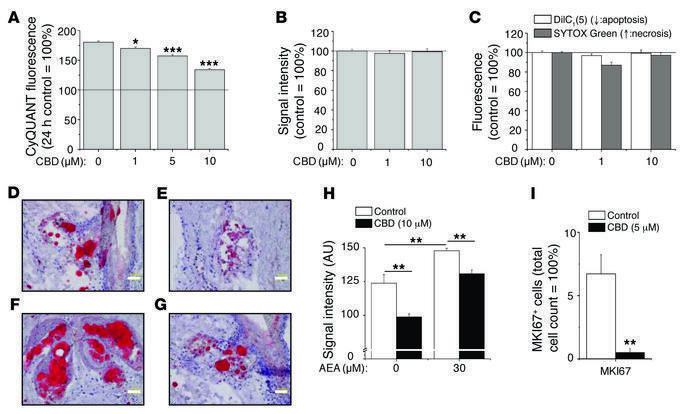 CBD exerts sebostatic effects in vitro and under “in vivo–like” circumstances. (A) CyQUANT proliferation assay after 72-hour treatments. *P < 0.05, ***P < 0.001 compared with the 72-hour vehicle control. The solid line indicates the level of the 24-hour vehicle control. (B) MTT assay. Viability of sebocytes following 48-hour treatments. (C) Cell death [DilC1(5) and SYTOX Green double labeling] assays after 24-hour treatments. (A–C) Results are expressed as the percentage of the vehicle control (mean ± SEM of 4 independent determinations). The solid line indicates 100%.Two additional experiments yielded similar results. (D–G) hSOC of (D) control, (E) 10 μM CBD, (F) 30 μM AEA, and (G) 30 μM AEA plus CBD 10 μM (14 days; sebum: Oil Red O staining, red; nuclei: hematoxylin, blue). Scale bars: 50 μm. (H) Statistical analysis of the lipid production on 4 histological sections per group. Results are expressed as mean ± SEM. **P < 0.01. (I) Statistical analysis of the number of MKI67+ cells as compared with the number of DAPI+ cells on 2 histological sections per group (hSOC; 48 hours). **P < 0.01 compared with the vehicle control. Results are expressed as mean ± SEM.